This seems like a potential disaster for the Knicks. Knicks fans, you may want to sit down for this. Everyone else, grab some popcorn and get comfortable. Knicks president Phil Jackson is open to trading power forward Kristaps Porzingis, according to Yahoo’s Adrian Wojnarowski. Of course, a bunch of teams are showing interest in the budding star. At 7-foot-3 with a silky jump shot, players like Porzingis don’t come along very often. He’s the Knicks best prospect since Patrick Ewing. He averaged 18.1 points, 7.2 rebounds and two blocks during his second NBA season and has the chops to become a perennial all-star. But it gets worse. According to Woj, one reason Jackson is open to trading Porzingis is he likes Lauri Markkanen, a 7-footer out of Arizona who should be available for the Knicks’ No. 8 pick in Thursday’s draft. Markkanen has received plenty of comparisons to Porzingis and definitely has the skills to become a solid power forward down the road. But the Knicks already have their 7-foot versatile big with an unblockable jump shot, and they know he’s not a bust. For all we know, swapping Porzingis and Markkanen could work out down the line. Many people thought drafting Porzingis in the first place back in 2015 was a major mistake, and look how that turned out. But Porzingis is a 21-year-old trending toward superstardom if he continues developing as well as he did during his first two seasons. Markkanen, a 20-year-old prospect, is nowhere near surefire star status. He’s basically a smaller version of Porzingis with a lower ceiling. If Phil Jackson thinks Lauri Markkanen is a replacement for Kristaps Porzingis, somebody needs to stage an intervention. 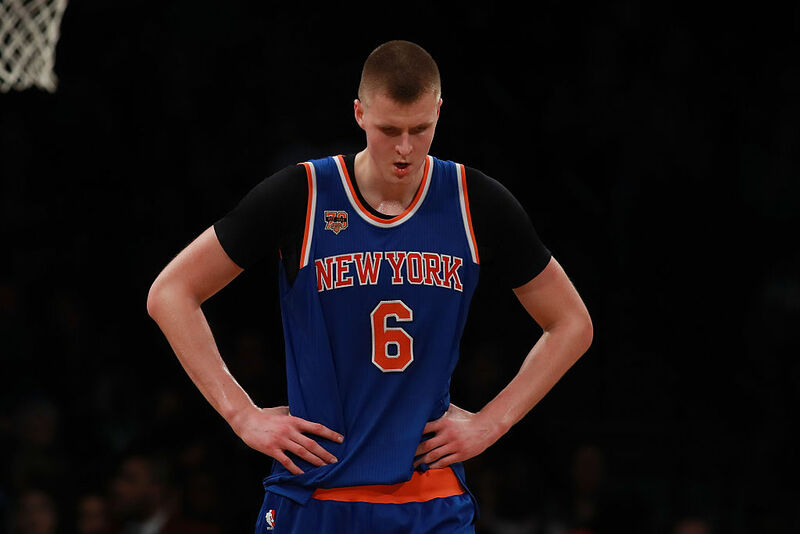 Relations between Porzingis and the Knicks got rocky at the end of this season over the Jackson’s poor treatment of Carmelo Anthony and insistence on running the triangle offense. Porzingis skipped his exit meetings, and no one from the Knicks has been in touch with him ever since, according to ESPN’s Ian Begley. Begley also wrote that, according to his brother Janis, Porzingis wants to stay in New York and win with the Knicks. Hey, he’s already picking up a New York accent. There’s speculation that the Celtics have been stocking up first round picks to make a run at Pelicans star forward Anthony Davis. Maybe Danny Ainge will have a new target now that everyone knows Porzingis is on the market.